Candidates can download the application form from the official website www.aiimsrishikesh.edu.in from 27 August 2018. The last date of apply online is 30 days from the day of recruitment notification publication date. Rs.3000 per post for General & OBC Candidates. 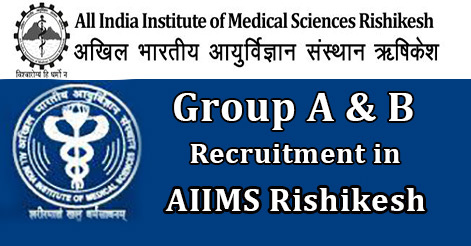 Help us to improve this article/job posting "Group A & B Recruitment in AIIMS Rishikesh". We would be glad if you can comment below and provide your valuable suggestions and feedback. If this page have any wrong information/list or out of context content, then you can report us as well. i have done polytechnic with cse and and i have a back paper which is not clear yet. result awaited.so can i apply for this job A & B group? Sir \Mam where will be exam centre of this recriute…? ex service man application fee exempted or not. Is this openings are for freshers ? l have done 2yrs diploma in Ct scan diploma from recognised institution reg in state medical faculty lucknow having 3yrs experience in medical college.